After An Earthquake You Will Want To Check Your Plumbing! After An Earthquake – Check Your Plumbing! You don’t have to feel it to know that it’s happened again. Local news stories and U.S. Geological Survey reports tallied up more than 60 earthquakes here in North Texas over the past year. That’s a whole lot of shaking going on, so it’s always smart to check the plumbing around your home or business after the tremors settle down. If you spend any time gardening in the Fort Worth area, you understand our soil’s clay composition. Earthquake shock waves reverberate through its compact particles and slam into plumbing systems. Newer homes and buildings with PVC pipes handle the stress better than older properties, but shifting earth damages joints and connections regardless of their age. If your sewer line has any kind of structural problem, an earthquake can crack it wide open. Interiors are vulnerable too because even small upheavals can pinch pipes and turn pinhole leaks into floods. Damp spots in the walls and water seeping across the bathroom floor are dramatic signs that your plumbing took an earthquake hit. Fluctuating water pressure is a less obvious indicator. You’ll notice this at faucets, but it also causes gurgles and bubbles in the toilet. Listen for dripping sounds behind walls, and make sure the water heater is operating properly. A quake can shift the appliance on its base and compromise gas, electric and plumbing lines. Keep an eye on the water meter for a couple of days, and watch out for unexplained usage spikes. 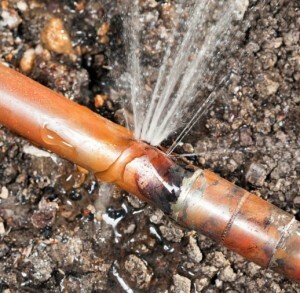 Any leaks around your water line‘s exterior connection deserve attention. While walls are a barrier to inspection inside, underground pipes pose their own set of detection problems. You have to inspect the yard for symptoms of earthquake damage to the plumbing. 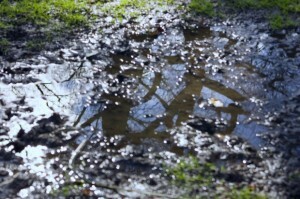 Pay close attention to persistent puddles and wet spots. If grassy areas and stands of shrubs take off on a sprouting spree, their sudden growth often signals underground seepage. Foul odors indicate leakage in your sewer main, and the bad aroma attracts rodents, so watch the yard closely for unwanted guests. If the idea of earthquake damage to your plumbing leaves you rattled, give Accurate Leak and Line a call. Our diagnostic services pinpoint water line and sewer main problems, and we handle residential, commercial and industrial jobs. We can’t stop the earth from shaking, but we can restore your confidence in your plumbing!